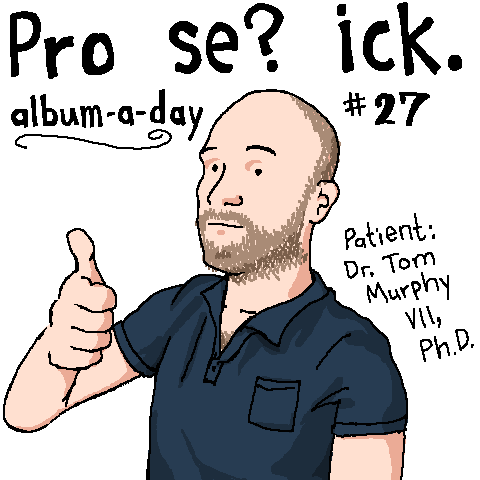 Tom 7 Radar: Tom 7 album-a-day #27: Pro se? ick. Haven't had time to listen yet, but let me say that providing the album in a zip file is a major step forward in your AAD distribution efforts. I'm being totally serious. Clicking those links was annoying. Also even though I had typed my name, that strangely showed up as anonymous. Let's see if it happens again. I should stop spamming your comments, but now I am really curious about how this is happening. I think if I edit the name field last, it will work. Yeah, I agree. It annoyed me forever, but since I have limited disk space on my server, I didn't want to maintain both a zip and the individual files. I figured out a pretty convenient way to efficiently generate them on the fly. It's on the list to go back and make zips for old ones, though unfortunately I can not give you your link clicking time back. I don't understand what's going on with the name field? It's possible that you got unlucky electronic countermeasures (designed to foil lazy html parsers by spammers) that somehow rendered that field invalid, though I don't think it's possible. What browser? Using chrome here, but it hardly matters and I won't be offended if you just delete those earlier posts. Listened a couple times through. There is a lot of good stuff here! I love the melancholy version of Spring Break (it was already one of my favorites). I like get lamp and it does a good job of hitting the mood I'm in when I play text adventures. Also I'm doing the PAX East thing this weekend and it got me pretty excited for the chiptune concerts. Shameless meta-meta-song is catchy and cute. #losing is nice, but I'm not sure I understand it. The song numbers in the notes don't agree with the album, but that seems to be a theme. Huzzah, I really like it. The cover art looks like an eerily accurate likeness. 27 is a lot of albums, sir. Sorry for double-posting, but I just remembered another thing to say. This album feels like a successful marriage of your old crazy song idea generation methods and your recent intricately clever lyric generation methods. Also, I always love getting songs that are more than just acoustic guitar and vocals: backups, electric guitar, percussion, and synth all help make a song feel super fun. Thanks Chris, Sontuk, jetfuel! I love album reviews. CC: Looks like I am suffering from the same anonymity problem, in Chrome as well. I'll look into it; might just be like ancient illegal HTML since this web page is literally 10 years old. The songs appear in the notes in the order that I wrote them (at least, the order I started them), which is why the numbers are not the same as the album tracklisting. Often when I record a song I just put down some backing tracks but don't finish it enough to give it a name or even make it recognizable, so I need some kind of temporary way to remember which one it is. Glad you caught the reference to TXT adventures on get lamp; alas this disc's best entendres are too personal to be accessible to almost anyone. fj: Well, yeah, it must be the facial expression and super tiny eyes that makes it eerie. :) 27 is possibly my favorite number (7 is too obvious right?) since it's my birthday. It's what I use on sports uniforms and stuff. But if you count three "Marm & Toc" AADs and two Taut Blue Quality ones, that's already 32! Still just over 1 a year for life, which I don't see why anyone would be impressed with that. I really appreciate the positive words about the lyrics; that's probably the thing I'm most proud of on this one. I actually don't know what you mean by the old crazy song idea generation methods though... certainly there's been some change (maturation?) since AAD #1 but I feel like this cassette tape is on the same train as the last few have been. Maybe more dramatic twists than usual. Anyway I shouldn't cast question marks upon sentences that contain "successful marriage"; just curious. Wow, this album is great. #losing is a classic, doesn't even sound like the sort of song you would expect on an AAD just by the quality and density of the songwriting. I love how your arrangements are getting more and more elaborate, you can really tell how different (and probably not as interesting) it would be if certain songs were just guitar+voice. Plus some of the subject matter/lyrics being a bit darker/more personal is a nice departure from the more tongue-in-cheek or goofier fare of most of your previous ones. This album is definitely top-tier up there with Fake Mars, sk7 and Betrayal for me, great work. Oh, also I just noticed some of the album pages are missing the links to all the other ones, actually a lot of them say "check out the links to the left" and there are none!! Oh no!!! Also: Fake Mars and BATKOC are among my favorites too, but I'm surprised to hear sk7 in the mix! "Sun beam melts ice girlfriend" is the only track I have no regrets about (and it contains one of my favorite lyric achievements ever), and though I like most of it, I would put #s 22, 24, and 26 over it easy, maybe some others from the 2X series, and definitely #13. I guess I often have this reaction when people say "I like this" which is "why do you like that one and not this other one?" which may come across wrong. I actually love that people have different tastes for my makes and when it defies my expectations, and thanks for sharing them. It's like having your kids not do what you had in mind for them but still be proud, you know? BTW Chris: Your comments were the lead-up to comment #10,000 (yours) so I could never delete them! Epic! Also I think from the years of limiting yourself you've become a pretty damn strong songwriter, so maybe there's not much reason to do that anymore. "for craps sake you have already learned how to operate a recording device"
I think the classic crazy song idea generation impression comes mainly from just two of the tracks, now that I analyze it. Shameless meta-meta-song does the thing where you make an obviously weak premise into a great premise by pushing it farther and farther until it's beyond any judgment of appropriateness. And Alto suxaphone takes a simplistic, gimmicky, self-referential musical/lyrical combo and wrangles it into something actually enjoyable. In that way, I think it reminds me of Masonry Jar and Not Doing Much, incidentally both from Spacewalk Underway. I keep saying that some outside influence may cause me to finally do an AAD, and maybe this time I actually will, but probably not. But Garage Band for iPad is bringing the bar pretty dang low. #losing is the one that got stuck in my head after a pass-through, but i should give the others another chance. I love the way several songs don't follow traditional verse-chorus-verse structure. Do these count as "through-composition"? I find this sort of song to be underutilized and as a result more dramatic. Is that live bass in Attorney-client privilege? Is that a first? A: AAD-17 I have a weird relationship with because for a long time I didn't have it on my phone, as I did not want to listen to it. I'm over that feeling now, but still rarely listen to it all the way through, except when I do an AAD marathon like on an international flight, in order to pass the time. I guess it sure does have some classics, like Based On Your Mario Kart Skills. :) And as for recording, I feel like I learn how to tell what's wrong with a recording (or that something is wrong) faster than I learn how to record well! A #losing battle! fj: Alto Suxaphone is definitely a throwback, made with real sugar. I'm glad you enjoy it; that's the first one to enter my usually-skip list. tadbot: Nice find! A bunch of people were asking about the music on that video, so I may have acquired new fans by setting them straight. c: thx! Yes, in my opinion, other songs can compete with #losing, so they are worth a chance. And sometimes I have actual emotions, it's true. fj #2: Good call. I have been trying to do this ("through composition" is a good name for it though I had never heard that before) deliberately on recent albums. I've always been a fan of short songs, mainly because I find repetition boring. But I found it's more fun (and challenging) to make songs that don't repeat by virtue of having many points and unusual structure. So thanks for noticing. :) It's electric bass played through a pod, but definitely not the first time. It's also on #losing, Shameless MMS, and on earlier albums as well (I think the first one was Blast Child or The New F-Zero?). Love the bass but I seldom feel like I have time to add it.